When you fall asleep, it is the body's natural mechanism to elevate a hormone called glucagon that increases blood sugar levels as desired by the pancreas. In response, insulin, also a hormone produced by the pancreatic cells, decreases. 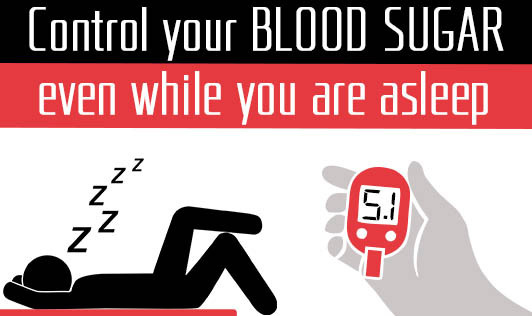 Reduced insulin results in lower suppression of blood glucose. Glucagon also signals the liver to breakdown excessive sugar that is stored as an emergency reserve in it. This further increases glucose in the blood circulation. Counter-regulatory hormones- cortisol, catecholamines, and growth hormones also tend to increase rapidly. These hormones typically elevate between 3 and 8 am, peaking between 4 and 5 am. Hence, this mechanism is termed as the "dawn phenomenon." Now that's the reason why you must have a light dinner that is low in sugar and salt, and avoid fried foods and maida-based preparations. Also make it a habit to have dinner early so that your insulin levels help control your blood sugar for a few hours before it is completely suppressed. Another way to control blood sugar better through the night is to take a walk after dinner. That will help enhance your rate of digestion and reduce blood sugar appreciably. But remember, you need a 20-minute gap after you eat, before you get on to exercising and you must replenish yourself with fluids low in sugar and fat when you feel tired.